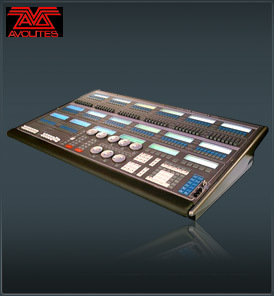 Avolites launched its latest console in it’s Diamond 4 Series, the “D4 Elite”, at LDI 2002. The console is streamlined to offer the maximum power and functionality in the minimum physical space, recognising the ever-growing need in all applications to use FOH and control spaces expediently. The Avolite Diamond 4 Elite offers all the features of the full sized Diamond 4, in a smaller chassis with 14 submasters and 96 assigned playbacks, with direct access to 96 fixtures via Legend Cells (re-assignable preset playbacks). Both D4 products have been developed in parallel. Avolites wanted to offer a physically smaller console in the range that still had the flexibility and versatility for which it’s products are renowned. The D4 and the Avolite Diamond 4 Elite are fully disk compatible, and the Elite features all the software functions of the larger desk, addressing the whole spectrum of production situations. For those with a relaxed programming schedule, Avolite Diamond 4 Elite’s direct access control surface offers intuitive and fluid programming, that will realise the full potential of the lighting design. Conversely, for those time-pressed moments when an LD has just minutes to programme a spectacular show – the Avolite Diamond 4 Elite offers immediate access to a powerful ‘instant’ toolkit. The electronic legending increases speed of set-up and allows the automatic configuration of a huge programming Palette. Increased software capabilities and dual VGA monitors make the console even more versatile, logical and fast to programme. Naturally, the D4 Elite also retains the hands-on intuitive feel that’s made Avolites’ desks the most popular ‘live’ operation consoles worldwide.